When I saw this scene, I felt that it had the look of a painted scene, extending beyond the actual reality of the painted dog by artist Luke Da Duke into something unreal, almost like a doll’s house. I set about deliberately photographing it in a very precise way, keeping all the lines as straight as I could, which necessitated lots of fiddling with the tripod to get the composition right whilst at the same time avoiding any converging verticals or distortion. I know that this can be corrected in Photoshop but I just wanted to get it as right as I could in camera. One of these days I’ll get a tiltshift lens to make this easy! When it came to processing, I added a linear tone curve (any alterations I make are always as Adjustment Layers as these are non-destructive and can be turned on or off – wish I’d understood this concept when I first started using Photoshop many years ago!) and then a fairly pale texture from Skeletalmess that just added a bit of grubby distress to the edges. 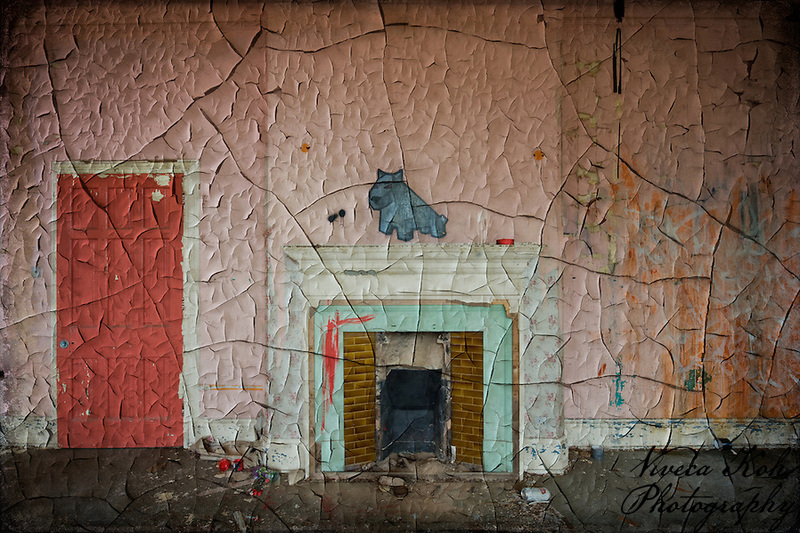 Finally I added a texture of cracked paint that I’d shot at Hellingly the week before, which gave exactly the look I was after – that of an old painting, possibly created on wood, where the painting was cracked and flaking – the kind that you might see in a museum or church. What do you call these? I can’t remember and Google has not helped – I was thinking fresco but I don’t think that’s it. Any suggestions gratefully received! Finally I added a Brightness/Contrast layer and brightened the image to +75, as the addition of both textures layers (especially the latter) had made it a bit muddy. On this occasion I didn’t have to do any of the usual painting out any of the effects with Layer Masks, and the result was ‘A Room With A Dog’. This entry was posted on Monday, February 14th, 2011 at 17:55. It is filed under How I Did It, Technique and tagged with Asylum, Digital Image Manipulation, technique, Textures, UE, Urban Exploration, UrbEx. You can follow any responses to this entry through the RSS 2.0 feed. like that – the texture suits the image well, and Luke Da Duke’s dog always does it! The colors and textures in this composition are brilliant – great Job! And little or no post processing! It’s always great to hear about photographers trying to nail a composition in-camera rather than fixing with post-processing. Great photo Viveca!